So much for cows being docile cud chewing animals! I am sure I would have been freaking out! We've been without a working furnace for 2 to 3 years now. Our landlady finally agreed to getting a new one, and on Dec 17th we had some guys here to clean out a bunch of junk so the heating guys could come in and dismantle the old one and put a new one in. Then the snow and cold hit and they couldn't get here. Yesterday they started to work on it, but then the rain hit and our basement now has a bunch of standing water in it! The guy here said they'll check on it tomorrow but probably nothing will be done till Monday or when the water recedes from the basement, SIGH! If it's not one thing it's another! This morning I put my 11 yr old cat to sleep. He had a bad heart since he was a kitten and the last few months he has just gotten worse. Despite being on meds he developed a clot and one of his legs was paralyzed. But he's at peace now!! I'm so devastated but at the same time I know it was the right thing to do. RIP, Zazu, my sweet boy! Oh my gosh, my heart is breaking for you LCW. I know what you're going through and I'm so, so sorry. So sorry for you LCW. 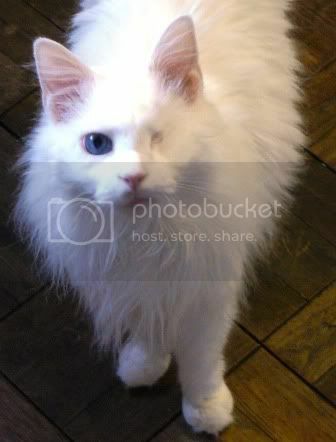 I once had a cat with one eye. Called her my pirate kitty. My worst thing is having a lot of trouble with my autistic 5 year old who is big for his age, and can't get a hold of the doctor. I'm getting really good at leaving messages. So sorry to hear about your kitty LCW - 11yrs old is young for a cat isn't it? He certainly looked like a character. What a beautiful blue eye! LoveHistory - thoughts go out to you re your son. Hope you can get the support you need. Me - not going to be around much for a few days. Just work. My server decided to upgrade their customer service and managed to shut down my Elizabeth Chadwick Account. Then in the process of re-activating, via a call centre in India, said operative succeeded in destroying my standard e-mail account too. I ended up shrieking at her after an hour I was so stressed. I am not proud that I did so, but enough was enough. She just wasn't trained up to the job she was supposed to. Told me it was a software problem my end. Was it bum. She finally restored my non business e-mail, but when I tried it out, everything was duplicating in my in-box. Eldest son came round tonight and fixed the problem within minutes - and he's a draughtsmen, not a BT operative! Evaluation form I sent off was blistering. So was my complaint. Why don't they train people to do their jobs properly! Anyway, the upshot is that once the account was released, 500 e-mails came in and my schedule is cranking up fast. So if there's a radar silence, I'm in Purdah, working. Sorry to learn about your beautiful cat, LCW. It's always heartbreaking when a much loved pet dies.